Simply put, the question besieging the mind of every Ethiopian is whether meaningful changes are about to occur in Ethiopia following the dramatic election of Dr. Abiy Ahmed as Ethiopia’s Prime Minister. Under normal circumstances, the officially announced and often debated political agenda of the candidate to the position of prime minister determines the expectations of people. 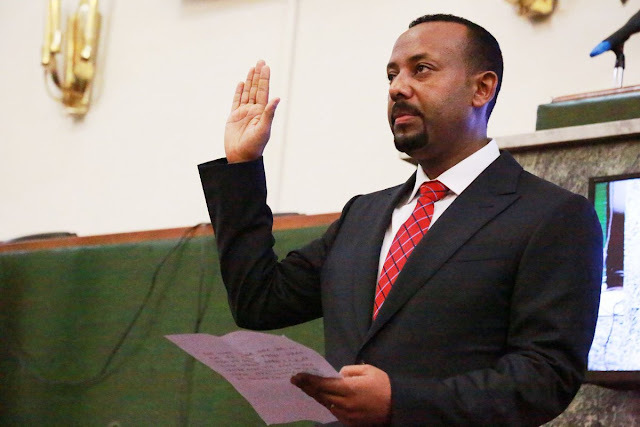 In the case of Ethiopia, however, a candidate committed to a reformist agenda––forcefully confirmed in his inaugural speech––was elected to premiership by a ruling party coalition that recently “approved” the imposition of a state of emergency. The state of emergency gives absolute power to the military apparatus with the express purpose of safeguarding the status quo by suppressing the ongoing popular demand for change. Hence the legitimate question of knowing whether the new Prime Minister can initiate serious reforms under a government and a ruling party coalition so openly opposed to change. Both Dr. Abiy and Lemma Megersa, the two prominent leaders of the reformist wing within the OPDEO, have publicly and repeatedly stated their reformist vision and have raised high expectations among a great majority of Ethiopian peoples. A key element of their vision is the restoration of the purpose of government that was long lost to the leaders of the TPLF, namely, that government is supposed to serve equally all the peoples of a country, not one particular ethnic group at the expense of other ethnic groups. One applauds their vision, but also one wonders how they competed for the position of prime minster while knowing perfectly the immense obstacles that the TPLF would inevitably oppose to the implementation of their vision. After all, the TPLF is the major and deciding force within the coalition. I am all the more perplexed by their decision to contend for the position as they run the danger of losing their reformist reputation each time the TPLF will block, as it surely will, any serious proposal for change. Look what happens when, like the outgoing Prime Minister, you have only the title but not the power. Be that as it may, there is no denying that the election of Abiy represents a great opportunity for peaceful change in Ethiopia. What is more, it offers the most chance of cementing the growing solidarity between the Amhara and Oromo, which solidarity is the best guarantee for the continued unity of the country. In light of the importance of the event, let us then make sure that we raise the right question. Accordingly, instead of asking whether Abiy can be successful while operating in a situation defined by the hegemony of the TPLF, let us try to determine under what conditions he can effectively prevail. The answer to the first question is a given: it is a flat no. Either Abiy will end up by being co-opted, like the departing Prime Minister, or he will be marginalized and powerless until he is blamed for all the failures and finally removed in disgrace subsequent to the loss of support, even among his own constituents. Only when the question is changed in the suggested way can we break the trap laid by the TPLF. Indeed, what else is the aim of allowing the election of a reformist leader by a regime opposed to reform but to discredit said leader? True, because of the popular unrest, especially in Oromia, the TPLF was forced to make some concessions. The election of Abiy is clearly an attempt to appease the protests in Oromia by picking as Prime Minister a promising leader from that region. But since the TPLF has no intention of allowing serious reforms, the election of an Oromo Prime Minister puts Oromo protesters in the difficult position of going against a government led by one of their own. This difficulty is the pause that the TPLF needs to buy time to strengthen its weakened position. Moreover, the continuation of protests in Amhara region runs the risk of being viewed as antithetical to an Oromo Prime Minister, with the consequence that it will undermine the solidarity of the two peoples. There is nothing that the TPLF needs more to perpetuate its hegemonic rule over Ethiopia than a confrontation between the Oromo and the Amhara. It springs to mind that the change of the question amounts to one thing, to wit, empowering Abiy. And there is only one way to bring about this result: the continuation, better still, the strengthening of the popular protests in all the regions of Ethiopia, including Oromia. Only thus can Abiy have the leverage that he needs to impose changes on a regime dominated by the reluctance of the TPLF, the most urgent change being the lifting of the state of emergency. The continuation of the popular uprisings will convince the TPLF that the only way to retain some form of power and, most importantly, to preserve some of the acquired interests, is by allowing Abiy to implement the demands of the people. Short of accepting this condition, the TPLF places itself in a situation of zero-sum game, obvious as it is that the unanswered demands will lead, sooner than later, to its downfall with the likely outcome of the beginning of a civil war. In other words, the selfish interest of the TPLF advises it not to stand in the way of reform under pain of losing everything by giving people no other choice than violent uprisings. However, if the protests come to an end because of promised reforms, not only no real change will occur, but also the TPLF will secure the necessary time to refurbish itself. Unless people strike while the iron is hot, getting rid of the TPLF will come at a much higher human and material cost, whose end-game could well be civil war and secessions.